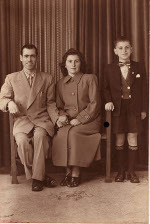 Naoum was born in Pergamos, Asia Minor, and came to Agia Paraskevi as a young boy- with his mother and brother. Above: The Vouyioukas extended family. 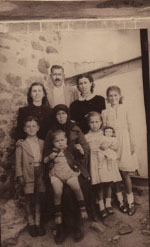 From left, they are: his wife and son, Irini and Stamatis; his brother and his wife, Ioannis and Maria- and their children, Anna and Eftihia; his mother, Marigo, is sitting and holding Giorgos Vouyioukas. Naoum is absent from the photograph, as he had already migrated to Australia. Above Right: With his wife, Irini, and their son, Stamatis.